Cozumel, Mexico. What could be better in November? Pretty much nothing, especially when you're coming from New York. It's the time of year cyclists have to wake up 45-minutes earlier than usual to be sure we have enough time to get dressed to ride. Ugh. 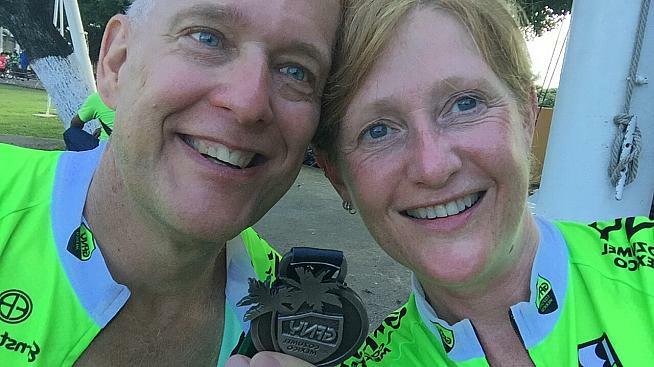 My husband Steve and I happily fled November in New York to participate in GFNY Cozumel, the perfect place to escape the dry air and chilly temperatures. 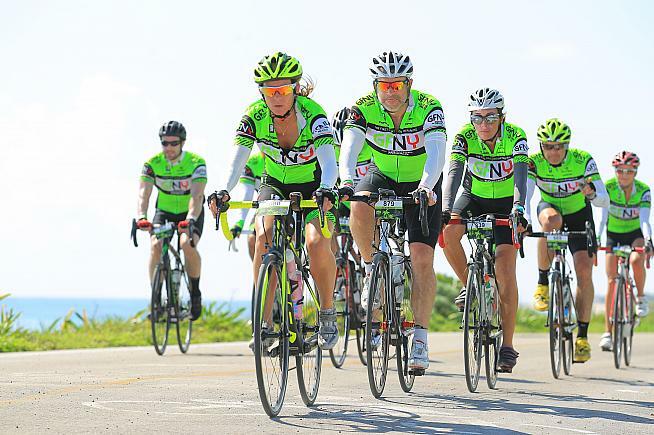 Shades were required equipment at GFNY Cozumel. Credit: Sportograf. First, a few words about Cozumel, the island is beautiful. It is in fact, a cyclist's paradise. Flat, hot, sunny, with what I will not call a "bike path" circling almost 3/4 of the island. It is not a "path", it is a "road" for bikes. Completely devoid of motor vehicles save the occasional taxi or scooter turning into beachside resorts. The riding there is a far cry from our normal cycling-stomping-grounds in New York where we live and train for GFNY. We were spoiled instantly. Steve and I arrived the Wednesday before race day and took a taxi to our hotel, about 8 miles south of the starting line. The first order of business was to put our bikes together. The balcony quickly became a makeshift mechanic's area. Our plan was to ride both Thursday and Friday to familiarize ourselves with the course and acclimate to the heat. I'm going to focus on this training ride because it turned out to be the most important ride of the trip as it provided us with all the intel we would need for Sunday. Thursday was a gorgeous morning, starting out at what seemed a reasonable 73º Fahrenheit. Uli and another cyclist, "Canadian Bob" met us at 7:30am, we were immediately appreciative of the separate bicycle road. Even though Uli and I had been teammates for four years, we had never had the opportunity to ride together as we led different group levels. It was a pleasure to finally enjoy the road with him. Heidi and Steve exploring the course. Both Steve and I started to take in the terrain, the light, the heat, and potential shade. I wouldn't exactly call the vegetation tropical forest as it's too short but it's taller than brush. It offered cover from the sun earlier in the morning and then again in the afternoon. This may not sound important, but we found it to be super important in our decision making process on Sunday. After about four to five miles of smooth spinning, the light breeze changed to a headwind, still light, but definitely a headwind. Uli and Bob went ahead, the job for Steve's and me for the day was to do an easy recon ride of the route. The brush started to thin out and the wind noticeably increased. We figured we were heading into the fabled "King of the Wind" section. As we rode out of the protection of the trees and sea grapes, we saw the left turn that takes you along the east side of the island, the wind started to pick up and stay steady in earnest. This is when we were given a taste of what it could be on Sunday. A straight-up side wind, consistent at around 12-16mph with the occasional gust that could definitely knock you around the road a little, depending on your weight. I would be remiss if I didn't mention that this is where the beauty of Cozumel shines brightest. It is truly stunning. Beaches, surf, and gorgeous vistas that go on forever, uninterrupted by hills or buildings. Since we were supposed to be doing an easy recon ride we took the opportunity to take some pictures. In the distance we saw the clouds were starting to look familiar in a "daily-Caribbean-rain-liquid-sunshine-downpour" kind of way. After another couple of miles, we saw a green jersey riding towards to us. It was Uli. He rode back to do the remainder of the route with us. It was a couple of miles later that the storm hit. I would be grateful for the cooling off after it was done, but while it was raining, it was intense. The sideways rain was stinging on the skin and sunglasses became useless. The wind got fiercer and the amount of rain on the road surface made it difficult to lean the bike too deeply against the wind as you could lose your edge. It was a balancing act to be sure. The good news is that most times, the storms are short and sweet, around five minutes at most. This was no exception. The three of us were happily air conditioned for the remainder of the ride. We made the left turn to ride the long flat back towards the city. We rode an awesome pace line through town, stopped to see where the expo would be and then Uli kindly showed us back to the beginning of the path and we rode back to the hotel. Warm weather and a warm reception. Credit: Sportograf. It was here I made my first discovery of the trip. Heat. The weather changes epically around 10-10:30am. Once the arc of the sun hits a certain place, there is no relief from the rays of the sun. I wasn't dehydrated, but totally overheated. Steve pulled me back to the resort, and it was a total slog. I had nothing in the legs. When we got back to the hotel, we needed to wash the bikes—the rainy section had left a small beach's amount of sand in our drive trains. The hotel staff suggested we wash them in the outdoor showers next to the pool. The moment I stepped into the stream of water, I felt a thousand percent better. Lesson learned. Keep cool on race day. Well, cooler anyway. Friday was a short morning spin and expo day! We took a short cab ride to the plaza where the outdoor expo was being held. It was an easy packet pickup, excellent vendors and a chance to see Lidia Fluhme at the GFNY booth. This time, we got a taste of the heat at midday without the benefit of a breeze or pool. It was hot. Really, really hot. Noted for Sunday. With our jerseys and race numbers, we were ready to put our feet up and wait for race day. Which we did, at pools and beaches, very happily. Race Day! We got to the start line via taxi just before 6am. (Travel tip: it's dark at 5am and there are no lights along the bike road. If you want to ride from any of the beach resorts south of the start line, bring head lights!) The way to the start was well marked with signage and manned by an army of volunteers. We found a comfortable place in the corral, took a few photos and waited for the sun to rise and the race to start. About five minutes later, we heard, "Hey! Is that Heidi!?" Both Steve and I turned to see three of my favorite guys from the GFNY training rides and race, Edwin, Glen and Ross who had flown in the day before! 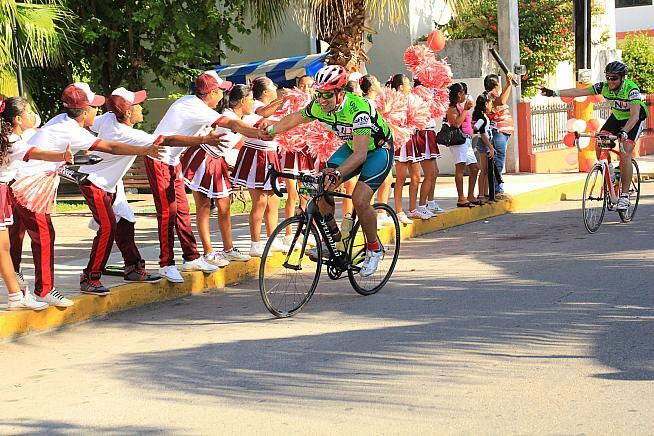 SO cool to see familiar faces, in GFNY kit, in Mexico! No echelons needed on race day. Credit: Sportograf. 7am came, the chute start was amazingly relaxed despite a field of 1,650 and everyone stayed pretty neutral until we hit the bike road. The guys who were really racing were long gone. Steve and I found ourselves with a great group of 10-12 other cyclists in a double pace line for the entire southern leg of the course. It was a pleasure to be sailing along at 19-22mph with very little effort. I checked in with Steve to see how he was doing, in a word, awesome! He was feeling spry and spinning strong. The warm weather combined with the pace line seemed to have woken up his dormant inner racer. We got to the feed zone right before the King of the Wind section in a very timely 57 minutes. We stopped got a banana, refilled our bottles and I dumped two cups of very cold water down my neck and back. This was my "Do NOT Overheat" solution. It worked. The King of the Wind section on race day was, wait for it...NOT WINDY! Here's the catch, no wind meant the heat could really beat down on you. We had decided in advance that we were not in contention for this section so we would ride together in echelon and save our energy for the second loop and end of the race. We stopped at the feed zone at the end of that leg, more water pouring, more watermelon, a gel, refills and we were off! The next flat section was smooth and when we got closer to the center of Cozumel, there were more and more people cheering the riders on. We turned right to head toward the airport leg and were hit with pavement that essentially mimicked cobbles. No lie, it was a little bit of a beating there. More effort to keep a pace and the vibration was muscle-ache-making. Third feed zone? The moment of truth...would we continue on to do the second loop or finish the Medio and take a DNF? I left this up to Steve. It was really important that he finish this, his first race after knee surgery and recovery, on a high note. I felt like we both had the energy but ultimately, he decided that we would only do the one loop. The calculation was where we would be on the course at the peak of the heat, 1pm. Almost finished, but we would have been exposed at the hottest part of the day. A no go. With that decided, I said that if we were going to only do the one loop we were going to go full gas the last few miles. We had a couple of gels and went. As soon as we were off the choppy pavement, we hit the big rings, got into the drops and I lead our two-man pace line to the finish line. We got to cross the line together, holding hands, with Steve feeling strong and like he could have done more. As we got our freezing, cold-water soaked towels and sodas (yay! ), we were able to watch the winner come over the line. It was thrilling to see such a fast and strong first place win. It was truly a wonderful experience, so wonderful in fact, we decided to register (and already have!) for next year's GFNY Cozumel. Knowing what we know now, we plan to go earlier, ride more and work to take a top 5 finish in the Him&Her category. Who knows? I cannot say enough about Shaun and Daniela Gad and their amazing organization of this epic event. Huge Kudos to them! I would be remiss if I didn't also give a shout-out to Uli and Lidia Fluhme who created this whole totally amazing "world" of GFNY. If you have the opportunity to participate in this event, do NOT hesitate! We'll see you there in November 2016! 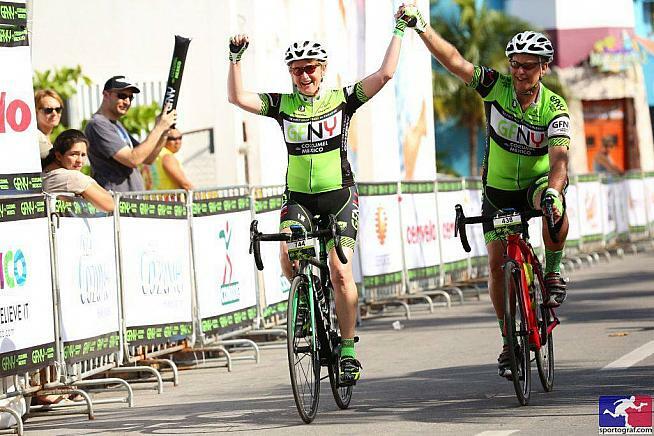 Heidi Broecking was a member of the Gruppo Sportivo GFNY for four years and Head of Group Rides for three years. Her husband (and awesome riding partner) Steve and son Devon have been her foundation of support and biggest cheerleaders. 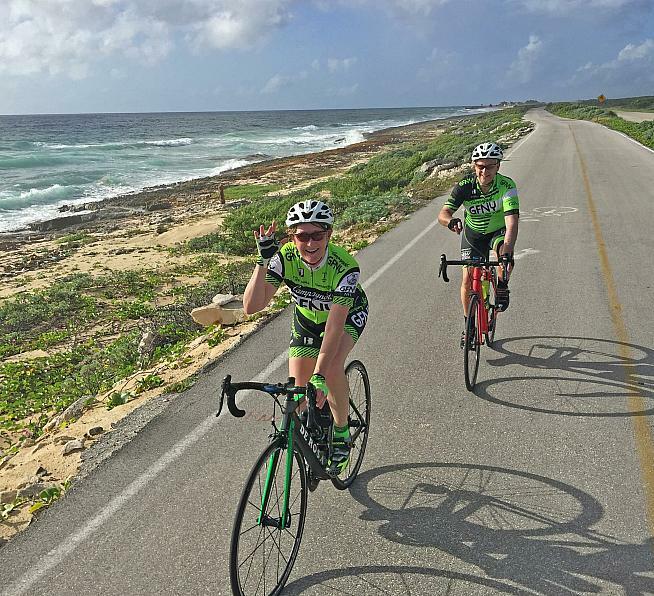 Steve had knee surgery in June of 2014 and GFNY Cozumel was his first race after an 18-month recovery. Heidi was beyond happy to be able to return the support he has so selflessly given her for the past five Gran Fondo New York events. 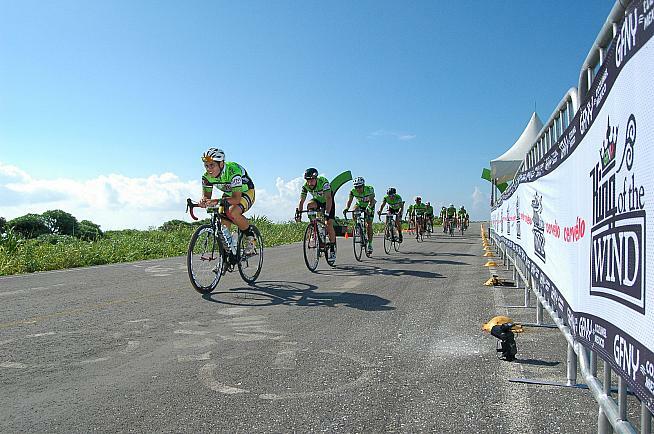 GFNY Cozumel is part of the GFNY World series of events around the globe. Campagnolo Gran Fondo New York on May 15, 2016, is the championship race of the series.